Never one to let a sleeping dog lie, I had to push the pineapple block just a bit farther. The process I am using for the Pineapple blocks intrigues me. The two words that push my creativity into gear are so simple: "What if..."
So What if the pineapple block center wasn't square but rather an oblong rectangle? What would it look like and how would the process work? I was expecting an oblong block that was pineapple like. But the only way I knew to find out for sure was to just try. I cut a center piece that was 3" by 5" and started. It wasn't long until I said "well that is strange." Instead of having dog ears to cut off, two of the four corners were square. Hmmmm.. So I cut them off as if they were dog ears to carry the pattern along. The block was more square than I expected also. 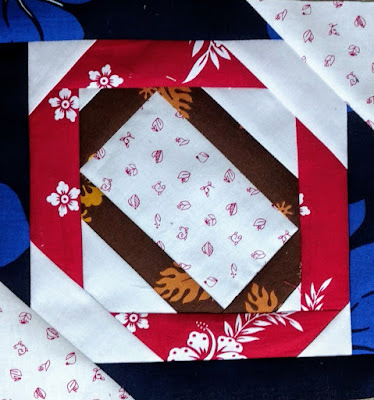 On the last round, I left the corners square and just added triangle pieces on the two angled corners. My name for this block is "Canned Pineapple" - you know, it isn't as good as fresh, but it is still usable. Honestly, this was more difficult because I had to remember where to sew next. On the regular pineapple block, it is easier to see where you are going and what comes next. Hmmm.... my art teachers said "You should work in a series." Does this count as working in a series? I think so. Ha ha. I think putting all my pineapples in one basket (quilt) will make a real crazy fun quilt. Love you wat of thinking!! Keep going. Hah, knew you were going to try this, and now you have OOAK! Don't think you will ever hear the name "Canned Pineapple" anywhere else. Nor do I think you might make a whole quilt9f these blocks, but who knows, you are always surprising us! And heaven knows by now, you never let anything go to waste. Such fun to experiment and see what happens! Canned pineapple is a perfect name for this block. All of your pineapple blocks will make an interesting quilt. What an awesome name.....and is that Samoan fabrics I see? I'm loving all the pineapples!! Nice work! !